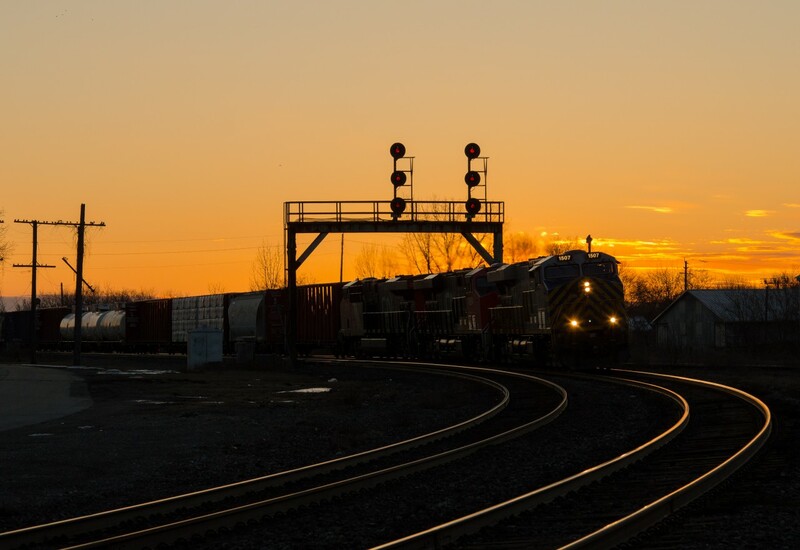 Railpictures.ca - Joseph Bishop Photo: CN 434 is seen ducking under the signals at Paris Junction with CREX 1507 in the lead, they are beginning their set off and lift at the junction as the last light of the day drops away. | Railpictures.ca – Canadian Railway Photography – photographie ferroviaire Canadienne. Copyright Notice: This image ©Joseph Bishop all rights reserved. Caption: CN 434 is seen ducking under the signals at Paris Junction with CREX 1507 in the lead, they are beginning their set off and lift at the junction as the last light of the day drops away. Arnold, I had already been home that night, had dinner and did the dishes, been to the gym and was back trackside for sunset! Well done Joe! A great shot, 10/10.